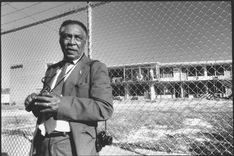 This week, the Memphis Commercial Appeal reported that celebrated civil rights-era photographer Ernest Withers had been a paid informant for the FBI, reporting on the whereabouts and activities of the movement’s leaders — many of whom considered him a personal friend. Withers, who died in 2007, recorded many of the key moments of the civil rights struggle, including the trial of Emmet Till’s murderers in 1955, the Little Rock School Crisis, and the aftermath of Rev. Martin Luther King’s death in 1968. He had unparalleled access to leaders such as King and the Rev. James Lawson. Memphis Commercial Appeal reporter Marc Perrusquia says he first become aware of Withers’ possible double life in 1997, when he was reporting on King assassin James Earl Ray’s effort to gain an early release from prison. A former federal official told Perrusquia that whenever King was in Memphis, the FBI had relied on reports of his activities from an informant in the city — Ernest Withers. When Withers died 10 years later, Perrusquia filed a Freedom of Information Act with the Justice Department requesting Withers’ informant file — knowing that it can be easier to get such material after a person is deceased. The government rejected his request, as well as an appeal, denying that the file existed. The agency did, however, eventually pass on a file that they had amassed on Withers in the late 1970s, when the photographer, who had become a state employee, was implicated in a “cash for pardons” payoff scandal. That file carefully redacted references to informants, Perrusquia says — but one slipped through. The sentence “Ernest Columbus Withers was formerly designated as ME 388-R” appeared above a redacted sentence in the report. “Why the FBI didn’t remove ME 338-R remains unclear, but the evident oversight provides the key that unlocks Withers’ secret life,” the Commercial Appeal says in its online version of the story. Perrusquia seized on this key. Combing through about 7,000 pages of public documents from FBI Memphis Field Office operations between 1968 and 1970, he found repeated references to source ME 338-R — Ernest Withers. Perrusquia says it’s not clear from the documents what motivated Withers to work for the FBI, or when he was recruited. “That’s the mystery with this. Only his informant file would answer those questions,” he says. On Wednesday’s NewsHour, we’ll have more on this story, including an interview with Earl Caldwell, a former national correspondent for the New York Times who covered the Civil Rights Movement with Ernest Withers.